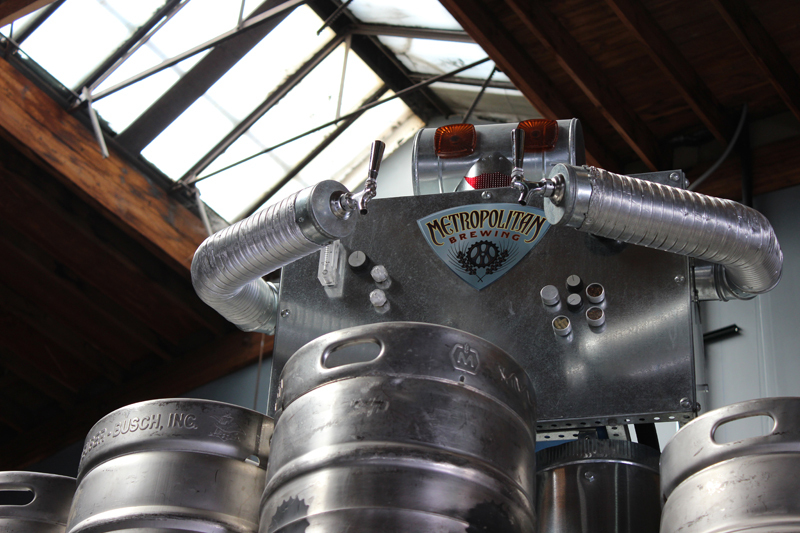 Metropolitan Brewing in Chicago converted two of its jockey boxes into robot sculptures. At its most basic, the jockey box is a utilitarian necessity: hard-sided picnic cooler, a few gauges and hoses, tap handles connected to kegs through cooling coils or plates. Connect the kegs, check the gas, dump in ice and you’re ready to serve draft beer wherever your travels take you. But at beer festivals, tabletop jockey boxes are usually hidden by—at the very least—a hand-hewn wooden cover that bears the brewery’s logo. The objective? To disguise the plastic, demonstrate a modicum of creative attention and differentiate the brewery on a floor of hundreds, if not thousands, of others. “Jockey boxes don’t look good. It’s the covers that clean up the display space,” says Anthony Wardle, sales manager for Fegley’s Brew Works, in Bethlehem, Pennsylvania. As more breweries compete for festival crowds, it’s getting easier to spot elaborate—if not ironically outrageous—jockey box covers that reflect brand identity, act as extensions of the tasting room experience and beckon people over to laugh, shake their heads or take pictures. Click here to see a photo gallery of jockey boxes. “We try to do a little extra something to put a smile on people’s faces,” says Tracy Hurst, president of Chicago’s Metropolitan Brewing. In Hurst’s case, “a little extra something” means spending $2,000 to convert two jockey boxes into robot sculptures she calls Oscar and Mabel. Standing at 5 feet tall and pulsing beer through their insulated pipe veins, Oscar and Mabel dispense draft brew through their hands. Oscar sports a pair of welding goggles that drinkers often don when snapping selfies with the bots. They both reflect the brewery’s post-futurism iconography and Hurst’s self-described ambition to propagate joy. “We have two big adult toys that pour beer,” says Hurst, whose tattooed arms are as robot-themed as her specialty beer packages. Located in pastoral Amish Country, Lancaster Brewing plays in a different aesthetic sandbox. Its painted wooden barn represents a rustic sense of place and glows with real lights that add a touch of coziness from inside the windows. Based in nearby Bethlehem, Fegley’s Brew Works’ jockey box brings a feel for the tasting room into the field. Wardle says that’s because the brewpub doesn’t have the budget to spend money on eye-catching signage. It decorates its cover with the same materials that adorn the pub–diamond-plate steel and a raised wooden logo that evokes Bethlehem’s industrial past. “If we’re going to serve the beer outside, it gives people an idea of what it might be like to drink a beer inside the restaurant,” he says. As a small outfit with a limited distribution footprint, Fegley’s uses one decked-out jockey box, which keeps overall construction costs low. Though you might expect a bigger brewery to dramatically jazz up its portfolio, that’s not always the case. A national brewery can’t necessarily blow its festival budget to costume jockey boxes from California to Florida, and if it’s aiming for a consistent marketing message, those manufacturing materials can add up. Funkwerks of Fort Collins, Colorado, distributes to three states and uses just one jockey box. So a few years ago, co-founder Brad Lincoln agreed to pay $400 for a custom-converted 1940s refrigerator whose top half slid over the box. But somewhere between fixing the face clock and painting the container lime-green to match the brewery’s color scheme, Lincoln laughs that his friendly neighborhood junk collector/tinkerer/brewery-stuff-maker “kept making cool suggestions.” Final price tag? $600. Lincoln doesn’t regret the cost and got three good years out of the old fridge before he passed it on to another brewery. In that time, he observed three things: People loved coming over to claim the logoed magnets pasted across the fridge face; older festival attendees who might have been repelled by Funkwerks’ edgy name or challenging flavor profiles were attracted to an appliance from their youth; and other breweries suddenly sported refrigerator-themed box covers, too. Though jockey box covers tend more toward the individual than the faddish, Lincoln noticed another trend not long ago. After a beetle infestation killed off forests around Colorado, some of the state’s breweries recycled the wood by commissioning covers made from the felled trees. Once in a while a brewer somewhere even lugs out a seasonal novelty. “Why not build a giant coffin and put taps into it?” Joe Vella, co-owner of The Brewers’ Collective on Long Island, remembers asking before a Halloween fest. Built according to real-life specs, the coffin emerges twice every October for a local “Punktoberfest” and a fundraiser for a bat sanctuary. It stands (or rather lies) as an example of what most brewery employees who put time and money into creating a memorable jockey box covers aim to achieve. Not only does it serve as a talk-piece and a landmark, it also expresses the personality of the brewery and encapsulates the spirit that makes beer enjoyable.